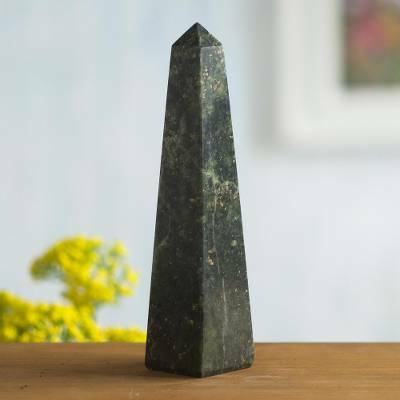 Geometric Jade Obelisk Sculpture from Peru (Large), "Prosperity"
Speckled jade becomes a sleek obelisk of magnificent elegance. Cesar Gonzáles selects a stone believed to attract wealth and prosperity. Its gentle green coloration is showcased through careful polishing. You can find jade obelisk 'Prosperity' (large) by Cesar Gonzales in sculpture categories such as Geometric Sculpture, Good Fortune Sculpture, Good Luck Sculpture, Hollywood Glam Sculpture and Natural Gemstone Sculpture. Enjoy exploring these sections for other Novica treasures. I was absolutely thrilled when I opened it. It is exactly as shown in the brochure. I hope they will enjoy receiving this on their anniversary which is July 10th. Beautiful work, thank you Cesar. "Beautiful addition to my collection"
Wonderful quality craftsmanship! After I bought it, we received an unexpected insurance payment! Adding to my stone sculpture collection! Thank you Cesar! The Obelisk is a great hand crafted piece. God bless his hands. It is a very,very great piece of art. This sits in a power position as part of a crystal vortex in our healing room. You can feel the vibrations when you handle it. I bought this with a couple pyramids and love my collection. Amazing quality and craftsmanship! Thank you!